Demonstrators throw stones, bottles and other objects at police, and burn garbage cans. Police are operating at the scene. 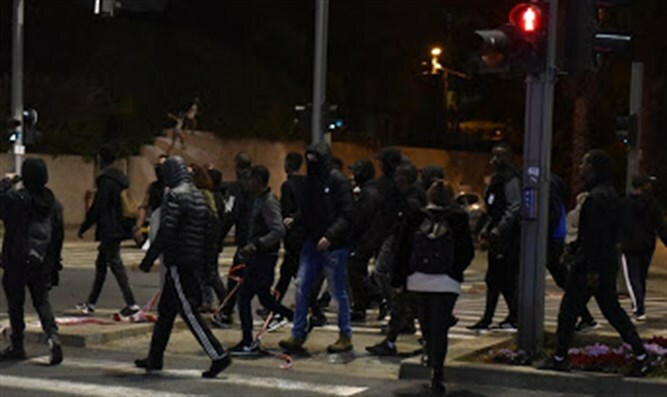 Dozens of demonstrators who took part in the Ethiopian community protest in Tel Aviv on Wednesday evening threw stones at policemen at the corner of Tel Aviv's Arlozorov and Namir streets. The rioters also tried to block the traffic arteries, burning garbage cans and throwing bottles and objects at policemen. Yasam police forces are in the area and are working to disperse the demonstration. The Halacha Interchange was blocked to the south after police estimated that the demonstrators would reach the Ayalon Freeway. "Israel Police respects the freedom of expression of every citizen who wishes to do so, but we emphasize that police forces will take care to act against any expressions of violence, both physical and verbal," police said. “ We will show zero tolerance for those who seek to violate public order and are liable to manifest a danger to the wellbeing of the general public. "We call on all protest leaders and participants to show responsibility and restraint in order to ensure that all expressions of protest are carried out within the framework of the law," they added.